STUDY | Spend the week studying 2 Corinthians 12:7–10. Consult the commentary provided and any additional study tools to enhance your preparation. LANDING POINT | Christ shows His strength through my weakness. Like Much-Afraid, we often wonder why God allows Sorrow and Suffering to join us on our journey. Their presence leads us to question His motives and forget His character. But God means to use these two companions as friends, not foes. Paul learned to embrace—and even boast in—suffering. Why? Because in his weakness, he was able to see the power of Christ at work in him. His suffering wasn’t the act of some cruel and heartless God. It was an act of grace by a loving God. Q: Why is human suffering a barrier for many in coming to and enduring in faith in Christ? Q: Share the story of someone you know who suffered well through a trial. It isn’t a stretch to say that Paul was one of the three most important people in the Bible. His story is covered extensively in Acts, and his letters make up almost half of the New Testament. He was a bold evangelist and church planter, and he led the charge to see the gospel spread to the ends of the earth in the early church. As with all great leaders, pride was a danger for Paul. He was a man, and “men at their best are at their best men,” as Martin Luther said. Christ loved Paul and wanted to protect him from becoming puffed up about himself. God allowed him to suffer a “thorn” in his flesh. We aren’t told what that thorn was, but it was so painful that Paul repeatedly asked God to take it away. Read: 2 Corinthians 12:7–10. Why is pride a danger for leaders like Paul? How can we protect ourselves and others from pride? Q: Recall a time when God allowed you to suffer. What did you learn about Him and yourself through your experience? Q: How can you guard yourself from resorting to self-pity and bitterness in suffering? Q: What does it look like to boast in your weakness? We all know suffering in one way or another. A loved one dies young or unexpectedly. A father loses his job. One friend betrays another. A tragedy puts your life on an unexpected course. These thorns prick us with reminders that suffering is part of life. Our hearts are panged with sorrow that life rarely happens as we expect or hope it would. Life feels messy and fractured rather than understandable and whole. When we suffer, we often ask God, “Why?” or ask Him to take it away. Paul had an unknown “thorn” in his flesh and asked God to take it away. But God didn’t take it away. Instead, He told Paul that His grace would be enough for him. God would show His power through Paul’s weakness. Your suffering doesn’t mean God has abandoned you or that He doesn’t care. Christ wants you to learn, like Paul, that His grace is enough to sustain you. Q: What would it look like to live like God’s grace is enough for you? Q: How can you use your experience in suffering to help others who suffer? When you think about it, Paul’s suffering was actually an act of grace. God loved Paul too much to let him become conceited. Paul’s thorn humbled him and drove him closer to Christ, and Paul learned to see his weakness and suffering differently. Through his weakness, he witnessed Christ’s power at work inside him. God loves you too much to let pride rule in your heart. Don’t be ashamed of your weakness. Your weakness reveals your great need for Christ. Therefore, embrace your weakness, admit your need for Christ and rest in His sufficient grace. Q: Where are you vulnerable to becoming prideful? How might you work against this temptation? Q: Why are we often ashamed of our weaknesses? The way of the Christian is humility, not pride. Christ can take your prideful heart and make it humble for Him. When your heart is humble, you are more receptive to God’s truth and more willing to obey Him. When your heart is humble, you are more willing to trust Christ and His power in you than to trust in yourself and rely on your own strength and ability. 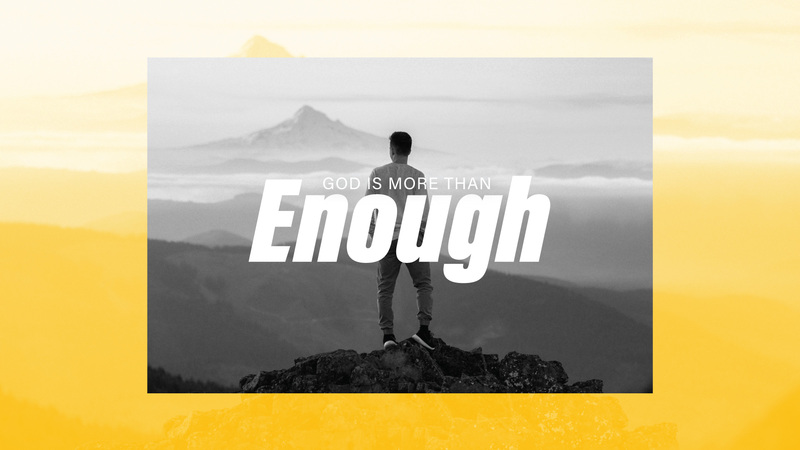 Let Christ be enough for you. Trust Him and see the difference it will make in your life. One day Christ will say, “Enough!” and put an end to the suffering, heartache and pain in this world. When that time comes, He will make all things new and whole, including you. For now, He asks you to rest in Him by walking in humility and trusting that His grace is sufficient to meet your needs and cover your weakness. Let Him be strong for you. Q: What are the differences between a proud heart and a humble one? Q: What’s one thing you can do this week to rest in Christ’s sufficient grace for you? Declare that Christ’s grace is sufficient for you. Ask Him to give you eyes to see suffering differently and to make your heart humble and obedient towards Him. Read Psalm 56 and reflect on how David views God in the midst of his suffering. While suffering is part of the human condition, Christians should expect that they will suffer like Christ did (John 15:20; 1 Thess. 3:3–4; 2 Tim. 3:10–12) and for His name (Acts 5:41; 9:16; 2 Thess. 1:4–5; Heb. 11:26).3 However, there are times when our suffering is due to our own foolishness and disobedience. Often God uses suffering to discipline us in His love (Heb. 12:3–11) and shape our character (Rom. 5:1–5). “When God permits suffering to come to our lives, there are several ways we can deal with it. Some people become bitter and blame God for robbing them of freedom and pleasure. Others just ‘give up’ and fail to get any blessing out of the experience because they will not put any courage into the experience. Still others grit their teeth and put on a brave front, determined to ‘endure to the very end.’ While this is a courageous response, it usually drains them of the strength needed for daily living; and after a time, they may collapse.”4 The only right response to suffering is trusting Christ and the strength that He gives to be enough or you. 1. Hannah Hurnard, Hinds’ Feet On High Places: An Engaging Visual Journey, Reprint ed. (Carol Stream, IL: Tyndale House Publishers, Inc., 2017), 35. 2. Richard L. Pratt Jr, I & II Corinthians, vol. 7, Holman New Testament Commentary (Nashville, TN: Broadman & Holman Publishers, 2000), 427. 3. Paul A. Hartog, “Suffering,” ed. John D. Barry et al., The Lexham Bible Dictionary (Bellingham, WA: Lexham Press, 2016). 4. Warren W. Wiersbe, The Bible Exposition Commentary, vol. 1 (Wheaton, IL: Victor Books, 1996), 675.